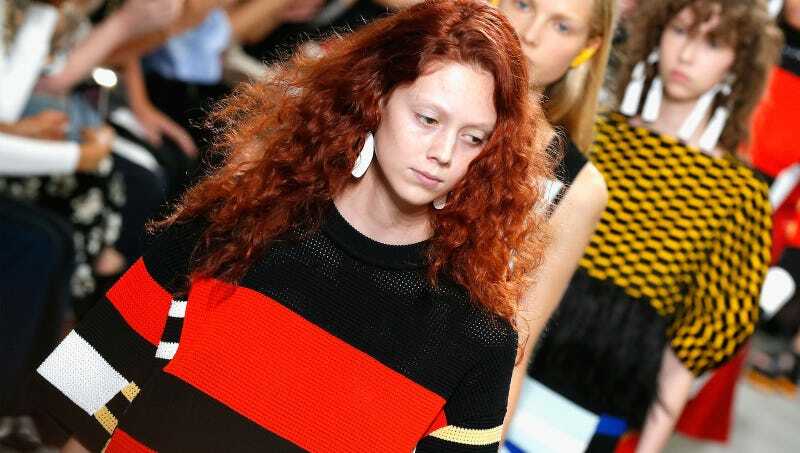 Proenza Schouler’s whole deal is encapsulating a cool, fun, feminine-but-not-overtly-so “downtown” archetype, and over the last few years they’ve seemed to increasingly refine their vision. They make garments that are familiar in that the designers seem like they already know you, but they never copy (they themselves are oft-copied, in fact) and they never feel redundant. For Spring 2017, which showed today in New York, designers Lazaro Hernandez and Jack McCollough wanted to “recontextualize our ‘girl’ in a way” through a confluence of colors, patterns, and unexpected shapes and cutouts. It was “a very spontaneous mix of ideas,” McCullough told Vogue. They found a woman in France whose specialty was weaving ostrich feathers into pieces through a loom, and uncovered thin leather yarn in Japan, from which all the hashed patterns are made. The geometries are lush and fully gorgeous in crimson, pumpkin, navy and yellow, as visibly inspired by the art world as the designers say they are—like paintings with a fluffy little add-on at the bottom of the canvas. At left includes a scan of a hand model, that recalls the pamphlets and fanzines of the Dadaist movement (surely the prices will feel the opposite of Dadaist, but that’s another story). At right, a heart cutout recalls classic papercutting, the art medium, and the earrings—ear pieces?—have the dangle and swing of a Calder sculpture. By connecting all these ideas to the artisanship of the people they employed to make these clothes, might Proenza be making a loose, subjective statement about fashion as an art form itself? I don’t think it fully needs to be explicit to be there.